I’ve got my fingers in a lot of pies, and some of them are literary – working with publishing houses on their marketing. This post, then, isn’t about food – though it could and should apply to cookery publishers. It’s about books. If you’re still with me, read on. The clever editors and production teams in publishing houses labour to great ends over the contents of their books. So they might baulk at being compared with a company which turns out nothing but blank pages – but they’d be wrong not to look at the chance to learn from Moleskine. The producer of high-end stationery and notebooks has, in the face of an an increasingly paper-free, digital world, grown into a hugely profitable business. Moleskine recently announced that it will go public at the Stock Exchange in Milan, floating at £280m. How has this happened, apparently against all odds, and in the middle of a recession? Moleskine’s strength lies, partly, in its role as producer of physical objects. It’s not a middleman for content, not a transmitter of information. It makes things, and as such is much less at risk of being eclipsed by new technologies. These technologies, for instance, increasingly mean that producers of content can get that content to consumers without needing a transmitter or mediator, be it in the form of a book, a news channel or a newspaper. Self-publishing is easier (as far as the technicalities go) than ever before, and journalists can now communicate directly with the public via blogs, Twitter and so forth rather than relying on an intermediary editorial platform. How long, say, before Amazon starts to do away with publishers altogether and channels authors’ writing direct to its customers? But if your position is not just related to your strength in physical production, but actually centred upon it, then you can’t do away with that. If your product’s USPs are tactile, then there can be no true virtual equivalent – well, not that we know of yet. But there’s more. Moleskine is not just the producer of beautiful objects. If it were just that, the company would be much less interesting – and less successful. 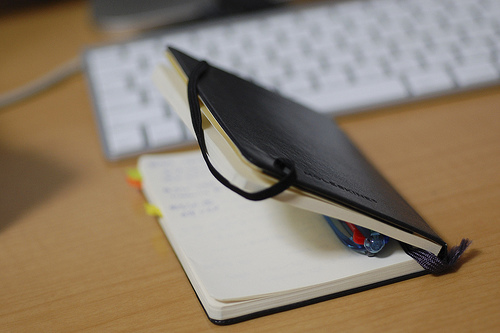 For Moleskine is also the producer of something not at all tactile – in fact, something quite intangible. The very cunning and most important trick of all is the way that Moleskine has succeeded in linking this intangible thing intractably to the physical objects it sells. So what is this magic extra element? It’s a dream, a self-image, an ideal. Moleskin is in the business of heritage, sophistication and tradition. Their notebooks come with a little tale of the company’s history and the illustrious writers who have supposedly used their products. Given that Moleskine was founded in 1997, these claims are perhaps spurious – but it doesn’t matter. Buying a Moleskine still makes you feel a little bit closer to being as good a writer as Hemingway, with no greater talent or effort required than handing over your money. And you get that buzz by purchasing the physical product itself. There is no digital substitute. This is what publishers could learn from. To avoid being superseded by pure content channels, publishing houses must convince readers to buy their books not just because they want to read what is in them – although they must and they should – but because buying those physical books is an act which makes the purchaser cleverer, wittier, better-informed, ahead of their time, in the know… well, the ways to flatter the consumer’s ego are myriad. Otherwise, the physical book will become irrelevant, and publishers – producers of content – will find themselves entirely cast upon the digital sea, with the big boys of Amazon, Google and social media as their peers. And that will be a tough battle to fight. You do not buy a Moleskine purely because you need something to write in. You could make notes on your smartphone, or use a fliptop pad at a fraction of the price. You buy a Moleskine because of how it makes you feel about yourself. That’s partly due to the notebooks’ physical qualities, but these are in fact only a subset of the strong, clever brand. Similarly, in future you will not buy a book just because you want something to read or to amuse yourself with on the train. There’s stuff to read everywhere. It’s coming out of our eyeballs, is at our fingertips wherever we are, and much of it is free. Rather, publishing house must build their brands to become more than just providers of words – no matter how good those words are. They have to become bigger than the authors and titles they acquire. They must become trusted lifestyle brands that consumers aspire to in and of themselves. Their products – paper books- must be covetable, not just because they are well-designed or nice to hold, but because physical ownership of these books means something more to their new owner than just some interesting words. After all, if Moleskine can do it with blank books, imagine what you can do with brilliant words inside. Reblogged this on Andy knows everything!.